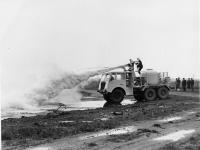 The Unimog trucks were widely used in public works, and the idea to create a vehicle specially adapted to these works was born. Why the municipal vehicle should have big all-terrain wheels, impressive ground clearance and half-bonnet design? As a result, in 1996 an untypical Unimog UX100 was presented. This vehicle has a cabin with an excellent visibility and a convenient enter-exit, as well as small-diameter wheels. The trucks were equipped with a 5-speed manual or automatic (for 4x4 versions) transmission. Nevertheless, this model did not become popular, because it was not so multi-purpose as the classic Unimog. A width of UX100 was 1.7 m, and a height was 2 m. Despite its modest size, the UX100 could carry up to 2 tons of cargo, and work as snow plow truck. It was equipped with a 4 - or 5-cylinder diesel engines "OM601" or "OM602" with an output of 73 or 122 hp. The steering wheel together with the dashboard and the pedals could easily move from right to left side of the truck - you just need turn the lever-clamp and move all to a chosen side.